HYDERABAD, India — As I arrived at the Begumpet airport here, part of a two-person delegation of the Communist Party USA, we were greeted by a delegation of bank workers and members of their union. 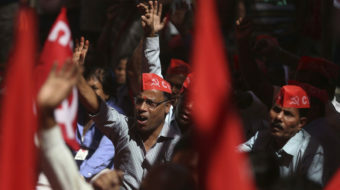 Standing by the baggage claim area were eight members of the Communist Party of India, holding a red flag with a white hammer and sickle and the initials, CPI. Did I mention it was 4:30 in the morning? 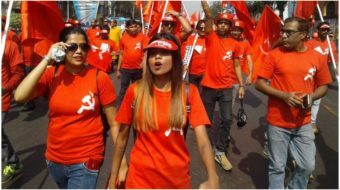 The Communists who are active in and lead the bank employees union took the responsibility to meet all the international delegates. 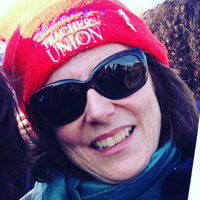 They said this particular union, associated with the CPI, has about 600,000 members. Our comrades told us there have been and will be strikes at this airport since the government is planning to close it down. The workers are saying that even though a new airport has been built, Begumpet airport should be kept open. Many are worried about what most working-class people the world over worry about, the loss of jobs. On arriving at the “holistic resort” just outside the city where the international guests are staying, we had coffee with two of our escorts. A few hours later, after breakfast, we headed to the CPI’s offices. A six or seven story yellow stucco building with the hammer and sickle flag flying on the top, it was a scene of great activity. The CPI’s general secretary, A.B. Bardhan, had just arrived from Delhi and some press was there filming him. He warmly greeted all of the international guests in this impromptu meeting, joking with the Australian comrade about the Indian-Australian cricket rivalry. Cricket is a huge sport in both countries. The CPI holds a few seats in the Andhra Pradesh state assembly. But their roots are much deeper than the number of seats reflect. The party is widely credited with a massive land reform fight in the state during the early years of independence and continues to enjoy much respect and support from the people. That these celebrations come at the same time may not be purely coincidental since they all seem to celebrate Spring and the ritual of “rebirth” of life and faith. Driving through Hyderabad, a city of about 3 million where the Muslim Nizzam reigned many years ago, you see so much going on that it’s overwhelming. Start with the traffic — buses, cars, trucks, motorcycles and three-wheeled taxis race through the streets in a never-ending competition to get ahead. Plus it’s left-side driving, somewhat disorienting for right-side drivers as in the U.S.